This was written a while back and is meant to be a simple intro for those new to communism. This intro is made to help assist newcomers to some of the simple misunderstandings surrounding communism. The negative history attached to communism has been the source of headaches for many modern communists, who attempt to explain it. Many already have a fixed idea of communism in their head, imagining hammers and sickles and dictatorships at any mention of the word. This is also the image many have been taught in history classes to associate with the word, and to some extent it is not wrong to think that. It represents a reality that has been stained in the history of communism, one that communists must not be afraid to confront. People are very quick to call out communism for the atrocities of 20th-century regimes that flew the red flag, and you will even hear the same for current regimes, with North Korea being in the news so often. I am not here to absolve these regimes of their wrong doings, but to give a fair explanation of what communism is, and shed new light on the subject. The purpose of this post is not to go into detail why past communist regimes were not following the actual communism put forth by Marx or any other communist theorist, but these realities, that have labeled themselves communist, cannot go ignored for an intro to communism post. So let us just start by explaining what communism is exactly and go from there. If you talk to any modern communist they will probably define communism as something along these lines: “The classless, stateless, moneyless society that emerges after the abolition of capitalism”. Now, this is not a bad definition to help anyone understand the basics of communist theory, it keeps it broad to include all theories of communism, but specific enough to not lose its meaning. Most importantly this definition is short and to the point, but there is a problem. This definition may seem clear to communists and anyone familiar with political theory, but for someone who has not interacted with much political theory, this definition may seem a little ambiguous, so let’s break it down. Classless: Here class is referring to social class, but we need to think of class a little differently than most know. Class is defined not by how much money you have or a social status, it is defined by your relation to the means of production (For simplicity, think of means of production as your workplace and tools or machines in it required to create anything). Although typically capitalists will have more wealth than workers do, class is not solely defined by wealth, wealth is gained by virtue of ownership of the means of production. Communist theorists describe two main classes that exist, worker and capitalist. You are a worker if you do not own your means of production, causing you to work for someone else to gain money and make a living. You are a capitalist if you own the means of production, and have others work for you. So classless would mean there is no distinction that creates the capitalist and worker divide, people who work own their means of production democratically without a capitalist. Stateless: The state is a concept most are familiar with. Think of the state as the government (Not the state as in California). The state is the mechanism that upholds class society as described before. A state can perform many functions that we are familiar with, but its minimum functions include the use of the nexus of police and prisons, lawmakers and courts, militaries and borders, etc. The communist critique of the state is that it exists as the collected instruments that one class uses to maintain disparities of power over another class (Capitalists over workers), concentrating power in the few. This leads to the reasoning that calls for it to be abolished and replaced with a more egalitarian form of self-governance. Moneyless: Pretty self explanatory, it literally means getting rid of money as the medium of exchange. This is hard to imagine as so much of our lives seem to be mediated by money. While we may think how much money we have keeps a roof over our heads, the communist viewpoint acknowledges that money is not intrinsically valuable nor necessary, and in fact becomes a hindrance to ensuring the well-being of, all society. Instead social planning for production and distribution will be based upon need, rather than creating an surplus for profit. You would not think about Stalin or North Korea if someone described communism to you in these basic terms, so why is it then that some of the most brutal rulers and regimes have gotten associated with something claiming to be emancipatory? Without going too much into specific theory and history, we can arrive to a quick answer. If you resurrected Stalin, Kim Il-sung, and Mao, and asked them what they were trying to achieve, they would probably answer they were trying to achieve communism. This is a debatable topic, but we will give them benefit of the doubt here and say they were actually trying to build communism, despite their grave mistakes. Maybe they were trying to achieve communism, through their own methods and ideas on how to do so. However, their attempts to achieve communism does not mean that any other attempts will have to follow the same path. Not only is this theoretically true, it has shown to be historically true as well, with the trend of communists known as libertarian communists or anarcho-communists. As one will discover, there have been many attempts at communism that did not resort to rampant authoritarianism, and a large portion of communists today do not subscribe to the same views on communism as Stalin or Mao. So with a basic understanding of communism as outlined, one might be inclined to say, “Well that all sounds good in theory, but in reality that seems pretty impractical”. This is a fair assumption to make. The inherent limits of knowledge play an important role in how we think, these limits being defined by their relative security and stability within an environment. So it is hard for us to use our current knowledge of the world we live in, to fully imagine what a society that operates with seemingly different principles would look like. So how can we bridge this gap? By using a relatable analogy to help us put the idea of a communist society in the field of our worldly knowledge. The analogy that is particularly helpful for this is the one put forth by Gerald A. Cohen, in his short book Why Not Socialism?http://www.jstor.org/stable/j.ctt7sk94.3." href="#footnote1_x3d0fic">1. In this book, he uses the example of a camping trip to illustrate the workings of a communist society. It is important to note that Cohen was from the fringe philosophy of analytical Marxism, so other Marxists and communists would not find themselves in perfect agreement with him. For our purposes, however, his camping trip can be used to explain the basics of how communism would work. We start with the situation that a group of people decides to go on a camping trip. Everyone on the trip brings whatever items they need for the trip, including their abilities and skills. They arrive at the campsite and everyone has brought their things, tents, sleeping bags, matches, fishing poles, pots, pans, food, etc. Even if you have not experienced camping yourself, you can imagine this as a basic camping situation. This basic camping trip offers two important utilities. For one, it is easy to imagine as something that exists in our world. Secondly, it can be used to represent some of the hard to imagine aspects of communism. On a camping trip, the campers all do their own part. Someone decides to fish, someone gets firewood, and someone cooks. Now to bring us back a bit, imagine the campers here as workers. This is easy to imagine as the campers all have a job to do and get it done. In order to get their jobs done, they will end up having to share the tools and resources they brought. They all share these things in common, with an understanding of who uses what and to the extent they can do so. The fruits of their labor also end up being shared in common. One person does not fish just for themselves, they fish so the other people will not have to, and in turn, they are given a share of the others’ products of labor. 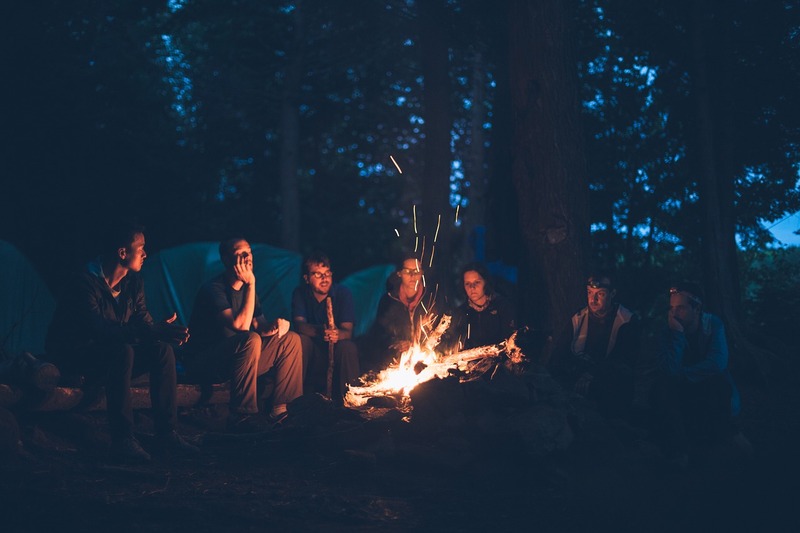 Along with sharing the tools and resources in common they also share a common goal, one that is just as present on a camping trip as it would be in a communist society. The common goal is to have a good time. After all is that not the point of the trip? To appreciate being in the world, enjoying the gifts of nature with people you can enjoy being around? With the idea of the camping trip in mind, it becomes much easier to imagine how communism would work. Let us go over the basic principles and see how they can be represented by the trip. During the trip, there are no classes that separate the campers. Everyone is treated equally as campers. Now of course on a trip, you may have someone who leads the trip or acts like a leader, like someone who leads a trek through the woods or coordinates what people should do. However, this is not necessarily at odds with the idea of classlessness. It is important to outline the differences between a leader, people voluntarily choose to follow, and a ruler whose authority rests on illegitimacy. A leader, in the context of the camping trip analogy, acts a guide who leads by example and suggestion. This guidance comes from their experience or expertise that makes them fit for such a role. People actively choose to follow this leader and his expertise because they find it to be justified. Although, outside of their experience and expertise the leader has no legitimacy to make others follow them. A ruler can start with the same foundation a leader would, having some expertise or knowledge that makes them have authority on something. Instead of leading those who voluntarily choose to follow them, the ruler enforces their authority, therefore enforcing the participation of their followers as subjects to their rule. In addition to this, the followers can choose to question the leader and choose to stop following whenever they feel they are not justified in their leadership, but the ruler leaves little room for challenge to their authority or their rules. The leader is perfectly in accordance with classlessness, while the ruler is not, as their coercive authority creates a hierarchal structure, that is opposed on the same grounds class is. It logically follows that without classes there is no state. The state is created by and helps to reproduce, the conditions for class society. On the camping trip, there is no government system that exists to maintain power. Of course, camping sites now exist within the borders of governments, but that still does not change the point of the analogy which exists as a microcosm. There is no group of people overlooking the camping trip to make laws and police your behavior, for the purpose of keeping a disparity in power. During the camping trip, nobody is going to charge one another for anything. Not only would this be grossly inefficient, it would ruin the common goal of the camping trip. It is difficult to imagine being on a camping trip where other campers charge you to light a campfire or to have some marshmallows. This is due to the understanding set forth earlier between the campers, that they will have to share their tools and resources in common if they want to have an enjoyable camping experience. In Cohen’s example, he points out that these norms of equality and reciprocity are something taken for granted even by the most avid opponents of egalitarianism. Which goes to show how much these norms fit with human practice, so much that we hardly think about or question it. If people can have a mutual understanding to work together for common benefit without using money to achieve this, why does it become so hard to imagine a society that operates without money? Maybe the microcosmic camping trip is not completely applicable to every other realm of society, but if anything it shows the idea of a moneyless society is definitely not out of human reach. (This is something that will be explored further in another post). If people are allowed to take whatever they want from the products of society, then why would anyone choose to work for anything? Let us imagine the same situation as described before, a bunch of campers all get together to relax and have an enjoyable camping trip. Suppose someone decides they do not want to do anything, and will just enjoy the benefits of everyone else’s work. There are a few ways this could proceed. The other campers would notice that someone is not carrying their weight, and just being a burden on everyone else. In that case, they would prod him to do something to contribute to the overall enjoyment of the trip. Then that camper decides to pick up his weight and contribute. Supposing they do not, chances are the other campers will give him less in comparison to the others, since he is still another camper, they are not gonna let him starve or anything. That camper probably will not be invited on the next trip either. There is also another possibility people overlook, if someone is not doing any work and the other campers do not notice the lack of contribution, then where is the harm? If it is not a noticeable problem that becomes detrimental to the overall experience of the trip, then it does not really matter. So how do you account for communism as attempted by Stalin and Mao? As explained earlier Stalin and Mao did not reach a stage of communism, although one can argue they may have attempted to, so that is reason enough to oppose communism. Using our camping analogy let us think of Stalin and Mao as campers on their way to the campsite. Campers can arrive to the campsite in different ways. Some may go backpacking or just take a car trip there. Well, maybe Stalin decided to take a backpacking trip to the campsite and ended up somewhere else in the woods. Then people hear about his horrible experience out in the middle of nowhere. It is unfair to say that he went camping when he never even arrived at the campsite. It would be even more unfair to say that every camping trip will end up as bad as Stalin’s experience because he got lost in the woods on the way to the campsite. If there is no money how are people being rewarded for their work? This goes back to the norms of equality and reciprocity. On a camping trip you do not expect money in return for gathering firewood. This may seem like an obvious statement, but the point here is that the norms that surround the idea of moneyless work, are easily accepted. In truth, people expect money for doing their job not because they want a green piece of paper. They want something else that they can get by using that green piece of paper because it acts as the medium of exchange used to get anything. Compensation is only a problem because the existence of money, that makes it required to purchase anything. During the camping trip, the campers do not use money because they all understand that they can just exchange the things they need. It is impossible to measure everyone’s exact contribution to the overall camping experience, so trying to represent their complicated contributions through a standard numerical value, would be erroneous. If the fruits of labor are the result of collective effort, it only makes sense they all collectively benefit. By working to contribute to the needs of other campers, they are entitled to take what they need in return. So the reward is direct compensation of what you need, not some piece of paper that can lead to an unequal exchange. The conditions of a communist society are something hard for us to imagine, especially living in a world that is so different from what communism demands. As distant from our reality as it may seem, communism is certainly not some abstraction outside of human practice. We tend to make conclusions about humans and human nature from just our empirical observations of what goes on in our world. But these conclusions are just as transient as the society we live in. They do not form a truly objective view of the innate nature of humanity. Even through experiences as simple as a camping trip, we can find many of the principles in practice, that communists espouse. Of course, the camping trip is not an exact depiction of society, but it shows that communism is not as unrealistic as it may seem. 1. Cohen, G. A. “THE CAMPING TRIP.” Why Not Socialism?, STU – Student edition ed., Princeton University Press, Princeton; Oxford, 2009, pp. 3–11. JSTOR, http://www.jstor.org/stable/j.ctt7sk94.3.